From November of 2015 here’s the poop on Dung beetles. Enjoy! Troy Bishopp (the Grass Whisperer and On Pasture author) says that if he comes to visit your pastures, one of the first things he’ll look at are the manure pats. Why? Because they can tell him a lot about the quality of what the cattle are eating, how often they’re being moved, and even where they like to hang out. They can also tell him if you’ve got beneficial insects that are helping you manage pests. Yep, Troy will be looking for those signs that you’ve got dung beetles. In fact, the more I learn about these little bugs, the more time I spend looking at poop too! Since livestock poop where they eat, that can mean that from 5 to 10% of the forage in a pasture is covered with manure and won’t be eaten. That’s not a lot but when your margins are slim, every little bit counts. Of course, you might also look at as forage that’s being trampled and returned to the soil, and in that case it’s all good. All that fertilizer that your livestock are scattering on pasture, and maybe even laying out in a more concentrated fashion with management intensive grazing, is a great start to improving the fertility of your soil. But you need dung beetles to complete the cycle. If left on the surface, 80% of manure nitrogen can be lost into the atmosphere. Dung beetles reduce that loss by quickly incorporating manure into the soil by rolling it up and hauling it underground, thus incorporating nitrogen into the soil. The dung beetle’s plan for those little poop pills is that they will feed its larvae. But the larvae use only 40-50% of the brood ball. The rest of that nutrient-rich organic matter is left behind for soil microbes, fungi and bacteria to use for creating humus. Between the nitrogen, the tunnels that increase soil’s water-holding capacity, and the addition of organic matter to your soil, those little dung beetles are doing a lot of good work for you! It’s likely that you have dung beetles already, though you may not have as many as you’d like. You can increase their numbers by changing the way you currently manage for parasites in your herd. Reduce your insecticide use, and keep in mind that Ivermectin can reduce dung beetle survival. Research has shown that the injectable version reduces dung beetle survival for 1 to 2 weeks, and the pour-on reduces survival of larvae for 1 to 3 weeks. The bolus version is most harmful to dung beetles, with effects lasting as much as 20 weeks. We found the following websites where you can purchase dung beetles do add to your pastures. Keep in mind that it may be possible for dung beetles from one part of the country to bring pathogens with them. So it may be a safer bet to collect dung beetles locally. 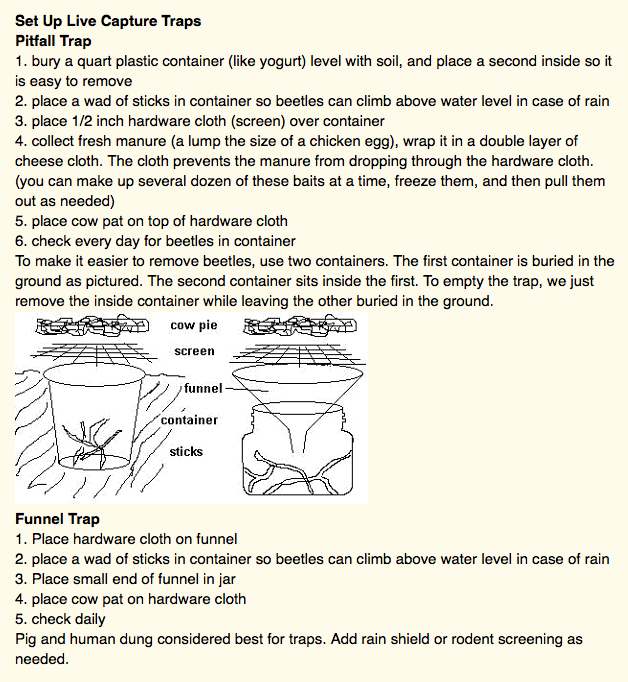 Here are instructions for capturing and moving dung beetles from Rincon-Vitova Insectaries. Check out their web page for additional information about monitoring your pastures for dung beetles. There are THOUSANDS of species of dung beetles, so we can’t tell you what you might have in your area. Your best bet is to talk to a local entymologist or someone from your local extension, or Conservation District office. 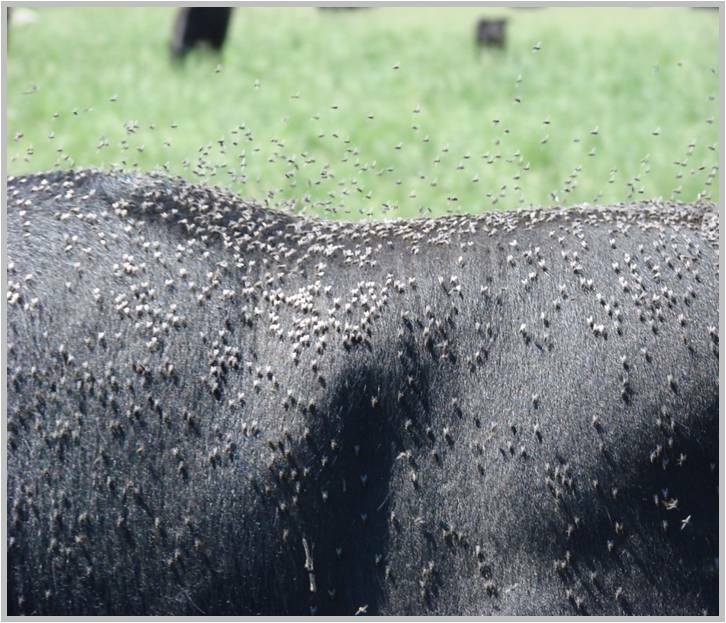 But, to give you a start for your first tour of your pasture, here are examples of dung beetles found in North Carolina. Thanks to the folks at North Carolina State University for these pictures and their fact sheet. Click on picture to see a full size version. What do you look for when the manure in question is sheep pellets not cow pats? How long does the sheep Ivermectin drench cause problems for dung beetles?